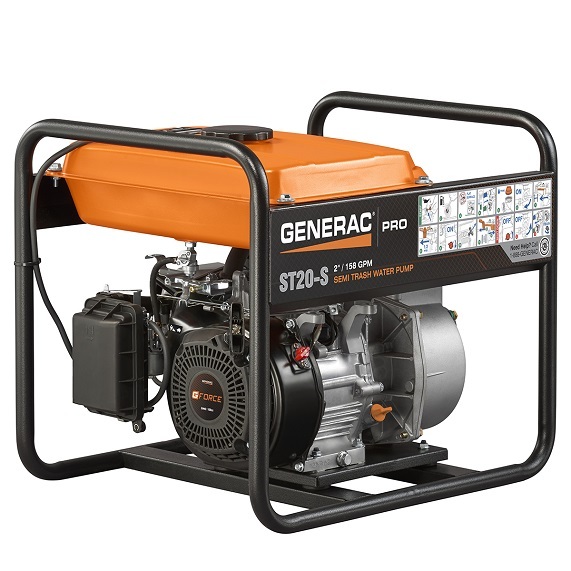 The Generac PRO 2-in. Semi-Trash Pump has the capability to meet all water transfer needs. Remove water from ponds or swimming pools. Get rid of unwanted standing water in farm fields and basements. Indoors or outdoors, from home to jobsite, this water pump gives you results. A fuel tank this large will provide five hours of runtime before you need to refill it. The tank is finished with durable steel to prevent wear and tear. This semi-pump’s custom funnel design with tethered priming cap makes for quick and easy priming. With a rate of 185 gallons per minute, this pump can remove hundreds of gallons in a single session. It also siphons dirt and debris, cleaning the area as it dries. This semi-trash pump has a durable 1-in. frame, which ensures the pump will withstand any harsh environment. Onboard Instructions- A label with demonstrative graphics makes using this pump simple. Comfortable Carry Handle- The handle is designed with a soft, rubber grip.